The United States Energy Association (USEA) is the U.S. member of the World Energy Council (WEC), the accredited energy body of the United Nations. USEA serves as a bipartisan organization that represents 150 members across the U.S. energy sector, from the largest Fortune 500 companies to small energy consulting firms. USEA’s team of international energy specialists work with the U.S. Agency for International Development to expand energy infrastructure in developing countries and with the U.S. Department of Energy to advance the policy discussions on advanced fossil technology. Through a cooperative agreement with USAID, USEA implements the Energy Utilities Partnership Program (EUPP). The purpose of the EUPP is to strengthen the capacity of utility executives and employees in USAID-assisted countries to effectively manage and operate power systems, run financially viable businesses, design off-grid power sources, and integrate different types of energy resources into their grids. The Government of Kenya has set forth its “Vision 2030,” a program to transform Kenya into a “newly industrializing, middle-income” country. Provision of adequate, reliable and cost-effective electricity is a key enabler for achieving the economic pillar of the Vision. Yet, Kenya has only 2,366 MW of installed generation capacity to serve its population of more than 43 million, which constrains economic growth. Kenya is believed to possess more than 7,000 MW of undeveloped geothermal energy resources in the Rift Valley. Wind and biomass energy are also significant potential sources for power generation. Power Africa is helping Kenya reduce reliance on expensive diesel-fueled generation and other high-cost fossil resources. Kenya’s energy sector development plans are outlined in the current 2015-2035 Transmission and Generation Master Plan. The plan projects that electrical demand will increase from the current 1,726 MW to 2,880 by 2020, and 6,833 by 2030, driven primarily by industrialization growth. To enable this growth, the Government of Kenya is focused on sustaining a stable investment climate for allowing private-sector participation in energy; developing expanded transmission and distribution networks to deliver power to customers; maintaining a creditworthy off-taker; maintaining cost-reflective tariffs; and reducing inefficiency in the sector to support more affordable end-user tariffs. One critical focus mentioned above is the expansion of the transmission network. The addition of the generation required to meet the Master Plan growth projections will require significant upgrades to the transmission system for it to safely and effectively deliver energy to the customers. Kenya Power requires greater understanding and training in the data, tools and skills needed to effectively manage the anticipated transmission system expansion. USEA and Kenya Power’s objective is to implement a fully functional network simulation model that the KCPL engineers can use to plan for future expansion of the transmission system. The course of work and deliverables outlined in this RFP are what is suggested by KCPL to fully prepare their engineers to operate and maintain a network simulation model. However, USEA is constrained by a $150,000 budget for this project. The consultant will endeavor to fulfill the entire scope of work within the allotted budget. However, if that is not possible, USEA will accept alternative proposals that alter and prioritize the scope of work that achieves as much of the intent of the RFP as possible while staying within the budget. The consultant will develop and apply a current state network simulation model for Kenya on which to perform power system studies to improve system reliability and security. The work is anticipated to take approximately 18 months. As a result of the technical assistance, Kenya Power (KPLC) will acquire the skills to perform real time operations, short circuit and dynamic analysis as needed to create an accurate network topology and plan for the expansion of their grid. Validation and enhancement of the existing Kenya power system PSS/E load flow and dynamic analysis model to provide an accurate real-time operations analysis model. Additionally, model updating and maintenance procedures will be developed to ensure its ongoing integrity. Capacity building in advanced application of the PSS/E software tool. Capacity building will be targeted at 12 engineers at various levels of proficiency in application of the software, who will receive hands-on training in advanced power flow, contingency, voltage stability and dynamic analysis. The engineers will also be trained in transmission planning, power system operation, integration of renewable energy and HVDC systems. Detailed analysis of the existing and medium term (3-5 years) planned additions to the Kenya power system, identifying the key issues and recommending improvements to meet requirements set out in the grid code. Technical reports will be compiled for implementation by KPLC /Ketraco. The Kenya Power and Lighting Company (KPLC) utilizes the PSS/E power system planning and analysis tool for transmission planning, network stability and grid operation studies. For this purpose, the company has maintained a fairly accurate load flow network PSS/E model and trained a few engineers in PSS/E software applications and transmission planning. The model, in its current form, has been successfully used in planning studies that do not require high-level detailed analysis. However, for accurate real time operational, short circuit and dynamic analysis, KPLC requires a validated real-time operational model whose fidelity to the actual network topology (steel in the ground) has been verified. The results of various power system simulation analyses performed by KPLC using the current operational model are therefore not as accurate as they would be were they performed on a fully verified and validated model of the current network state. Accordingly, KPLC experiences some operational problems that could be more easily identified and resolved with an accurate operational model of the current network topology. The work is estimated to take six quarters (approximately 18 months) with the goal of building expertise at KPLC and KETRACO through extensive hands on experience. Starting with the currently KPLC model of the Kenyan network for 2020 and the planning model conducted in coordination of five regional utilities, prepare draft load flow operational models of the existing state of the network based on data on network element parameters provided by KPLC/KETRACO. The model should be developed in sufficient detail such that it may be used short-circuit, relay protection coordination, as well as for the development of dynamic models. During the first quarter, conduct a 5-day project inception and PSS/E applications training (“Training 1”)to prepare KPLC/KETRACO to develop/improve its national load flow models for the existing network topology. The consultant will define key data and formats for the data to be collected by KPLC and KETRACO. The required data will be collected during 1st quarter in readiness for the 2nd capacity building training. The models will be constructed to represent three characteristic regimes (shoulder (mid-morning), peak and off-peak) and three hydrology scenarios for each regime (wet, average and dry hydrology). The existing KPLC/KETRACO load flow model and the model from the regional model will be used as the basis for development of the updated model by incorporating newly collected and available system information (e.g. technical parameters of power lines, transformers, number of busbars and substation single line diagrams). Prepare the method for future model verification/validation based on the real system data (snapshots). Prepare the operational model and training report which should include the developed models critical overview, recommendation for future steps, training overview and conclusions about the overall productiveness of the training. During the 2nd quarter, the consultant will conduct a three-day training (“Training 2”) to further enhance KPLC modelling and analytical capacity to perform advanced contingency analyses such as multi-level contingency analyses, tripping simulations and corrective actions, voltage stability and reactive power planning. During the same visit, the consultant will provide a presentation/update to KPLC and KETRACO on ongoing issues and recommendations. KPLC will collect the operational parameters of network elements installed on the network, with guidance from the consultant if needed. Using the existing and newly collected data, refine the operational load flow model (Current Model). Prepare a report on approach, accomplishments and recommendations. The report shall contain all input and output data in useful format, description of the regimes modelled, analysis and conclusions. Collect data and establish data and information plans for Task 2 as described below. Prepare realistic scenarios in consultant with KCPL/KETRACO for mid-term horizon target year (3-5 years) by utilizing the previously developed model for the current state and incorportating new transmission assets, generation facilities and regional interconnections. Review the current KPLC/KETRACO transmission development plan for mid-term horizon target year from the perspective of network upgrades to 400 kV voltage level that are necessary to evacuate power from the new generator(s) requesting connection to the network. In the 3rd quarter, conduct a 5-day capacity building, network planning and analysis training program (“Training 4”) to include detailed load flow and security (N-1) analyses focusing on possibilities to evacuate power from the new generator(s) and committed regional wheeling transactions considering KPLC/KETRACO reliability criteria. Based on the previous bullet analyses, the consultant shall perform technical evaluation of KPLC/KETRACO transmission network adequacy and give observations and recommendations related to possible alternative solutions that should be considered in order to prevent possible network congestions. Prepare a report on study, findings and recommendations. Make a presentation to the KCPL/KETRACO stakeholders (to be combined with “Training 4”). KPLC/KETRACO to collect available sequence and dynamic power system data. Conduct a one-day technical meeting for data input/collection and method approval. Conduct a 5-day capacity building training program (“Training 5”) to enhance KPLC/KETRACO short circuit analysis, dynamic simulation and analysis during the 4th quarter. The training will include theoretical aspects of power system dynamics, estimation methods for unavailable dynamic data, validation of dynamic responses etc. Conduct transient stability and small signal stability analysis of the existing and projected 2020 system including the expected regional interconnections, committed wheeling transactions and committed generation projects additions. Prepare a dynamic analysis report and recommendations for improvements to maintain/ improve power system security. The consultant will conduct a pre and post assessment in each phase of KPLC’s knowledge in the subject matter. Drafts of each assessment will be provided to USEA for feedback before finalization. The consultant will prepare a closing “results” report providing a summary of the methods, and specific and general overview of the results of the technical assistance for the Kenya utility and the Kenyan electric grid. The consultant will assist the United States Energy Association to develop an operational network simulation model of the Kenya power system (KPS) using the PSS/E software platform. Upon completion of the operational model, the model will be utilized to carry out power system planning and operational studies including analysis of requests for connection/integration to the high-voltage network of selected new power generation plant, renewable energy projects and other power system equipment. The trainer will conduct advanced training of KPLC engineers in PSS/E applications and transmission planning, and interconnected grid operations. The proposed model will be developed for the current state by updating and validating the current model used by KPLC. KPLC and KETRACO will provide detailed network, equipment and load data to be used for verification and improvement of the PSS/E model elements. The operational model will be developed will be used as a training to further improve the capacity of KPLC and KETRACO engineers in the use of the PSS/E planning software. Shortly after initiation of the project, the consultant will conduct an on-site project inception and begin the training program. As part of the proposal, the consultant should propose a combination of formal trainings and/or workshops, depending on what is deemed most appropriate for this capacity building. In addition to PSS/E software training, the consultant will define key data requirements and formats for the data to be collected by KPLC and KETRACO. With guidance from the consultant, as needed, KPLC and KETRACO will collect the data over a period of three months following project inception. The consultant will update the KPLC PSS/E model with the collected data and then validate it against real-time operation by comparison of its outputs with monitored outputs of the operation of the Kenya power system recorded at the national control center. The result will be an accurate and verified representation of the current network topology. The model will be suitable for daily operational use and power system analysis, i.e. load flow studies and contingency analysis, short circuit fault levels, new generation connection requests, renewable energy integration studies, transient stability and dynamic analysis, etc. During the 2nd quarter, the consultant will conduct training to further enhance KPLC modelling and its analytical capacity to perform advanced contingency analyses considering multi-level contingency analyses, tripping simulations and corrective actions, voltage stability and reactive power planning. Following this, KPLC and KETRACO will prepare realistic scenarios for mid-term horizon target year (3-5 years) by utilizing the previously developed current state model. With support from the consultant, the KPLC/KETRACO team will conduct detailed load flow and contingency analysis with emphasis on evacuation of the proposed new generation connections and network security. This will be covered during a 5-day capacity building and network analysis training during the 3rd quarter. The analysis will identify power system constraints to full evacuation of the electricity produced by the generators and their impact on grid stability. The analysis will identify the investments required to alleviate network congestion and bottlenecks, and other power system constraints that may compromise network reliability. During the rest of the third quarter KPLC/KETRACO will collect sequence and dynamic power system data (in formats provided by the consultant) and update the existing short circuit and dynamic analysis models. The consultant will then conduct a 5-day capacity building training program to enhance KPLC/KETRACO short circuit, dynamic simulation, and network stability analysis during the 4th quarter. The training will include theoretical aspects of power system dynamics, estimation methods for unavailable dynamic data and validation of dynamic responses. The consultant will prepare a KPLC 2020 dynamic model and short circuit and dynamic studies to assess network stability. The analysis will identify and recommend further network requirements to ensure medium-term network equipment adequacy and dynamic stability. The consultant will detail this in a medium term KPLC network short circuit and dynamic analysis report. During the 5th quarter the consultant will conduct a 5-day capacity building training program in the modeling, simulation and analysis of intermittent renewable energy systems (wind and solar) and HVDC systems in PSS/E software. This will include theoretical aspects of integrating intermittent renewables into the power system in terms of grid stability (voltage, frequency and dynamic stability) and detailed stability analysis in PSS/E. Based on the analysis, the consultant will assist KPLC to identify practical levels of penetration of intermittent renewable energy in the current and medium term (2020) KPLC network. The consultant will make recommendations on optimal renewable energy penetration thru year 2020 system and required improvements or additional network equipment to insure grid stability due to the addition of the contracted renewable energy projects. 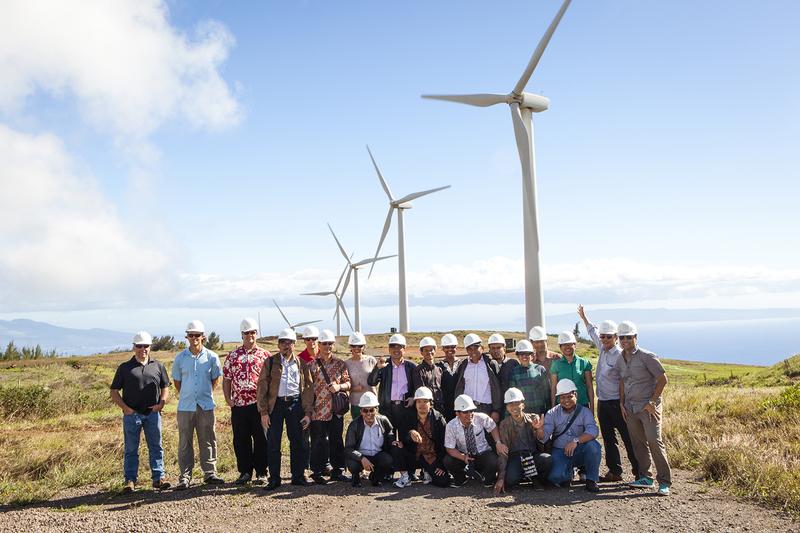 This aspect of capacity building is complementary to the renewable integration study (RIS) under the Grid Management Support initiative by Nexant consultants that covered the operational (dispatch) aspects of wind energy integration. The following is an illustrative scope of work leading to the development of the operational load flow, short circuit and dynamic KPLC PSS/E model and its use in power system studies and analyzing new generation project(s), including renewable energy projects and HVDC systems. Note: If consultant proposes a scope of work that is different than what was proposed by KPLC and outlined in this RFP, the consultant must also propose appropriate corresponding deliverables. Demonstration of an understanding of the issues to be addressed under the proposed scope of work specified above by providing a summarized technical approach for each of the tasks listed (Maximum 2 pages). Proposed project schedule to perform the tasks under this project highlighting any deviations from the proposed statement and scope of work specified above. Proposed schedule should be broken down by quarters. The schedule should include objectives for each phase’s task, responsibilities and assignment of those responsibilities (e.g. consultant versus KPLC/KETRACO), deliverables for each task or activity (e.g. reports, data input summary, draft manuals, policies, etc. ), and proposed due dates. Bio sketches of personnel, including at least 1 – 2 subject matter experts including team leader that will be dedicated to the project. Each bio sketch must be limited to ½ page. Summary of relevant experience of each proposed team member for (not beyond) the past 10 years. Relevant experience should be listed chronologically (starting with the most recent). Maximum one page per person. Completed USAID Consultant Employee Biographical Data Sheet forms for each employee proposed for this project (https://www.usaid.gov/forms/aid-1420-17). Salary history must be included; information will be kept confidential. Consultant’s Data Universal Numbering System (D-U-N-S) number and proof of current registration with System for Award Management. The proposal may include background information/summary of relevant experience on the organization; however, this should be limited to no more than 3 pages. Selection of an offer for contract award will be based on an evaluation of proposals against technical merit and budget justification. Proposals shall first be evaluated from a technical standpoint based on the technical proposal without regard to proposed budget justification. For those proposals determined to be technically acceptable, budget justification will be evaluated. The required e-mail notification of intent to bid of should be e-mailed to [email protected] with a read receipt. Please include “EUPP Kenya RFP – Current State Network Simulation Model” in the subject line and provide your name or name of organization and contact email address as well as a short note describing your intent to respond to this solicitation in the body of the e-mail. All questions related to this RFP should be submitted via email to Sarah Blanford at [email protected]usea.org no later than April 9, 2018. All questions and answers will be provided to all prospective bidders. Interested parties are requested to submit final via email with a read receipt to Sarah Blanford at [email protected].